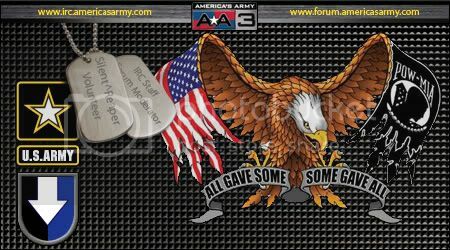 Welcome to the Squad Recruiting section of the Official America’s Army Forums. We’re glad you’ve taken the first step in advertising or looking for a clan by reading this sticky. There are a few things you should know about this area. You can post a reply to the “PLAYERS LOOKING FOR CLANS (ONLY! )” to be contacted by a clan that would enjoy having you as a member. Another great way to find a clan is by posting your own topic in the Squad Recruiting section to have other clans reply with their advertising message. When posting any information for a clan to look review, please post information that would be helpful in knowing a little about you and how you would like to be contacted. Remember; do not post any personal information on this public forum. We encourage all clans to list themselves in the Squad Recruiting section. When doing so please make sure you do not have more than 1 topic advertising your clan on page 1 of the Squad Recruiting area. Feel free to post in topics where players are looking for a clan however please make sure you don’t post your message more than once, or bump old topics. We’d also ask you simply look through the “PLAYERS LOOKING FOR CLANS (ONLY! )” sticky, as this contains the names of players actively seeking clans to join. The fundamental purpose of this section is to initiate contact between a clan and those users wishing to join one. It is not a place for conversing, establishing terms and otherwise discussing any issues relating to the recruitment of individuals to your clan. Please use Private Messages, email, instant messengers or clan forums for further discussion. To maintain a certain level of order, you may only repost your recruiting thread once it is off the first page. Bumping your old thread is not allowed. If you have made a post asking to join a clan and then do so, please post in your thread that you are off the market. We will only close threads at the request of the original poster.